Pumping, Pumping, Pumping --- Kablooey! Here, Joseph T. Salerno of the Ludwig von Mises Institute provides spot-on analysis of the Fed's pumping, pumping, pumping tactics in its continuing backstop of the U.S. Treasury's machinations to continue expanding federal spending. President Obama tells us the federal government simply must keep spending money, else we will surely suffer a dismal fate. Never mind that the money the U.S. Treasury is spending is simply new money created by the Fed. Somehow, I think that even people who have never studied economics or finance really do understand the vacuousness of the President's argument. I think that most people really do understand my well-rehearsed pronouncement in EconoBlast, "you can't borrow what hasn't already been produced and saved." Check out the nearby chart, which is one of the most interesting in Salerno's analysis. 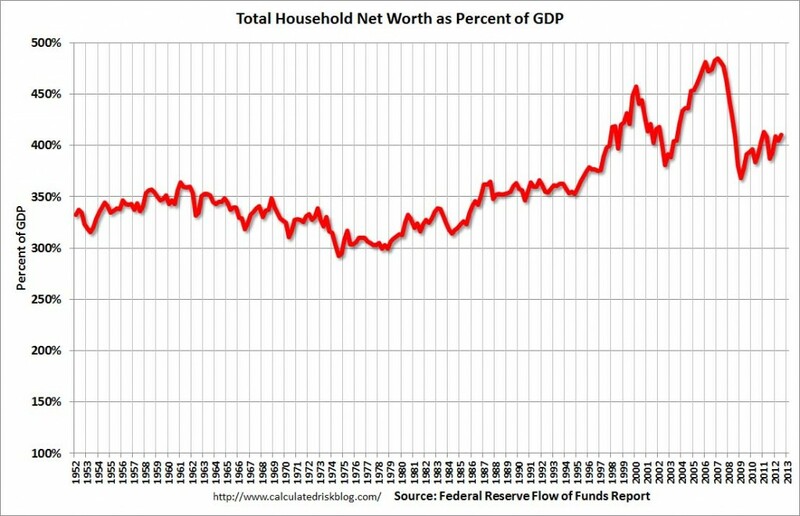 The chart "Total Household Net Worth as a Percent of GDP" reveals fascinating evidence for a dark hypothesis that I can't seem to shake, despite its tin-foil-underwear implications. Allow me to explain. GDP is the total dollar value of final goods and services produced within our geographical borders in a year. Total Household Net Worth (let us call it THNW) is the dollar value of assets minus liabilities owned by American households. Up until 2008, a whole bunch of that net worth resided in the form of residential housing. A whole bunch still resides there, but not as much as in 2008. Net worth is accumulated savings of households from income earned over time --- in a word, "capital." Saving is that part of household income that is not consumed each year to sustain life and finance household consumption spending. With those basic financial definitions in place, let's explore the information revealed by the chart of THNW as a percent of GDP over time. Just as Salerno says, THNW as a percent of GDP fluctuated in the band of 300% to 350% from 1952 through just about the end of the 1980s. Notice, though, the downward trend in the ratio from the early 1960s through the decade of the 1970s. Remember the decades of the 1960s and 1970s? I do. America was fighting the Vietnam war in the 1960s (I was in that war; draft, you know). With that war dispatched, America began waging President Lyndon Johnson's "War on Poverty" near the end of the decade. Throughout the decade of the 1970s, price inflation in the United States grew to reach 10% per year by mid-decade and approached 14% by the end of the decade. Those of us who lived through the decades of the 1960s and 1970s pretty much understood that we were not really becoming wealthier as the prices of oil and gasoline continued their upward march with the Fed pumping furiously on the money supply. America had to finance its misbegotten war in Southeast Asia and its War on Poverty somehow. It did so through the graces of the Fed creating ever more money for the U.S. Treasury to spend. Paul Volcker, Chairman of the Federal Reserve, appointed by Jimmy Carter in 1979 and reinstated by Ronald Regan four years later, righted the ship at the opening of the decade of the 1980s. Price inflation had to be stopped, and Volcker did just that. He did it by bursting the bubble in U.S. Treasurys that his predecessor Chairs of the Fed, Arthur Burns and G. William Miller, had pumped up to finance the Vietnam War and the War on Poverty. Following Volcker's bursting of what I will call the "Wars Bubble," the ratio of THNW to GDP stayed above 300% but below 350% until the mid-1980s. The ratio began to grow in the mid-1980s as the economy enjoyed real growth, not inflation growth, reaching a new plateau just above 350% throughout the decade of the 1990s. The decade of the 1990s, the most economically prosperous time ever on planet earth, saw the ratio of THNW to GDP rise to just above 350%, until mid-decade. 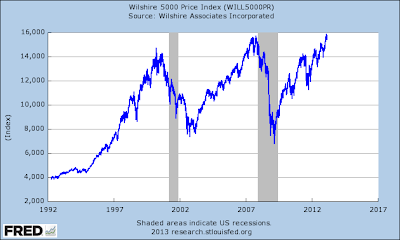 Beginning in 1996, the ratio began to rise on trend, topping 450% in the year 2000. Of course the ratio began to rise. The Fed, under guidance from Chairman Alan Greenspan, was pumping away, fueling what is now called the "Dot-Com" bubble in the stock market. Like all financial bubbles pumped up by money creation --- a phenomenon that Salerno points out is a repeating event --- the Dot-Com bubble had to explode, and it did. I remember the Dot-Com bubble well. Everyone was getting rich quick in the stock market. American households were elated with their new-found wealth. But of course, the new-found wealth wasn't real; it was just a financial asset bubble. The ratio of THNW to GDP plummeted, as it must, when the Dot-Com bubble burst. But this time the Fed was determined to fight. Greenspan continued to pump. And a new bubble was born. We know it today as the "Housing Bubble." Pump, pump, pump went the Fed, and up, up, up blew the housing bubble. Americans were once again riding high and getting wealthy. Anyone could do it. Even people who had insufficient income to borrow money to buy a car could borrow money to buy a house. With the help of the Fed, the Housing Bubble raised the ratio of THNW to GDP to new, dizzying heights, pushing above 450% with a steely eye on 500%. But, as always, like all other financial bubbles pumped up by the banking system, the Housing Bubble literally exploded in 2008. But the new Fed Chair, Helicopter Ben Bernanke, would not take this bubble bursting sitting down. Chairman Bernanke has led the Fed's pumping, pumping, pumping with previously unseen zeal since the bottom of the Great Recession, continuing to this day. Guess what. A new bubble has formed. Asset prices in particular sectors of the economy are rising, rising, rising. I wrote about this new bubble a few days ago here. Do you think this new bubble will burst? Of course you do. It has to. Now here comes the dark part that I can't seem to shake. 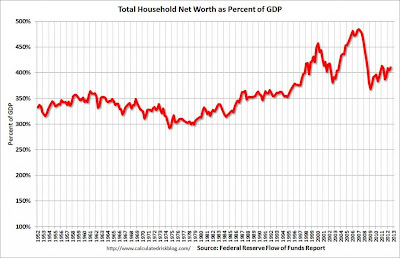 All that fake net worth above the 350% of GDP mark has to get wiped out somehow. Real wealth is about real stuff. Real wealth is not about money. We all know that real GDP around the world is languishing, even as the ratio of THNW to GDP in America is back on the rise, thanks to the pumping, pumping, pumping of the Fed. So what's dark about that observation? I don't think bubbles just burst naturally, anymore than I think that bubbles get pumped up naturally. What's usually called "the business cycle" isn't a naturally occurring phenomenon like hurricanes are. It takes a flawed banking system led by a central bank (or banks too big to fail acting in concert) to pump up an asset bubble. Always has, always will. World history, not just American history, is full of asset bubbles created by pumping, pumping, pumping fiat money. The pumping requires the confluence of strong central governments and highly concentrated banking. The banking can be highly concentrated under the leadership of a central bank (as it is now), or it can be highly concentrated under the collusion of a few big banks (as it was in the run up to creation of the Fed in America in 1913). Everyone can't be wealthy at the same time in a world of scarcity. But central banks can pump, pump, pump up asset bubbles for a time, creating the illusion of wealth. But because it is illusory wealth, not real wealth, the fake wealth must be extinguished somehow. Why? Because paper wealth cannot long buy real goods and services in a world of scarcity. As Robert Heinlein put it in The Moon Is A Harsh Mistress, "there ain't no such thing as a free lunch." I call that line the "economic maxim." Did you know back in 2008 when the bubble would burst? Neither did I. I knew it would burst, but I didn't know when. But some people knew when. That's the dark part. Financial bubbles don't just burst. After all, the pumping, pumping, pumping by the Fed could be continued to stave off the explosion. Of course, continued pumping would eventually lead to a rising and high rate of general price inflation across all goods and services, instead of just rising asset prices. The Fed cannot allow that; way too obvious what's going on if price inflation gets out of hand. That's what happened in the decade of the 1970s, until Volcker burst the bubble on purpose in full view of one and all. We humans learn. The Fed has learned. The Fed still pumps up asset bubbles, but it doesn't keep pumping so long that general price inflation gets way out of hand. The new bubble in town will be burst. I don't know when. Wish I did; I could become very wealthy if did know. If you have your 401(k) or your 403(b) back in the stock market just now, be forewarned. If you have your wealth in U.S. Treasurys, thinking those will surely be safe assets, be forewarned. If you have your wealth in corporate junk bonds just now, because the yield over U.S. Treasurys is the only yield in town, be forewarned. Even if you have your wealth in Midwestern farmland acreage, just now, be forewarned. Nearby is one more chart I stole from Salerno's excellent article. 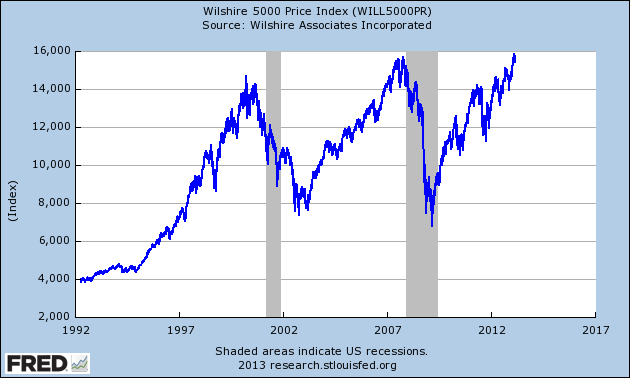 The Wilshire 5000 index can be taken to be a record of what the stock market did over time. Let's see; pumping, pumping, pumping --- kablooey! Pumping, pumping, pumping --- kablooey! The next kablooey may not be far away. I don't know when, but someone will know before it happens. I hope that Peter Schiff (check it out here) is off the mark this time, but I don't really think he is. If you have any questions or comments after you watch this video, please post them. Federal Reserve Board Governor Jeremy Stein said there isn't an imminent threat to the wider financial system (in an address Stein made in a symposium at the St. Louis Federal Reserve bank recently), but highlighted several markets—including junk bonds, mortgage real-estate investment trusts and commercial banks' securities holdings—as areas where potentially troubling developments are emerging, possibly as a result of the Fed's easy-money policies (a.k.a., quantitative easing). In 2007 --- just before the credit bubble created by the Fed in the preceding seven years exploded --- Ben Bernanke had expressed his confidence that no imminent threat was at hand to the wider financial system, even though the housing market was CTD (circling the drain). Right. So, perhaps readers will forgive me if Fed Governor Stein's assurances now are less than comforting about the new credit bubble in town. So what's going on? Let's see if we can understand. The Fed keeps interest rates historically low (in the basement, actually) by purchasing assets --- typically U.S. Treasuries --- in the open market. If you understand how that works, great; if you don't, trust me, you can ask around; I'm not lying. The Fed buys bonds with new money, which the Fed creates with key strokes on a computer. No printing press needed; it's all done with computers these days. What happens to the new money? The new money gets deposited in the banks of whoever sold the U.S. Treasuries to the Fed. If it was the U.S. Treasury itself (which usually isn't the case; the Fed does not like to be that transparent), the U.S. Treasury's bank account now has new money in it. Of course, the U.S. Treasury spends the new money rather quickly. Sixty percent of the spending is to pay recipients of entitlement programs and recipients of other transfer payments. If the seller of the federal debt wasn't the U.S. Treasury (say a bank, a private citizen, an investment company, an insurance company, a sovereign account, a business, or anyone who wanted money instead of the U.S. Treasury they sold to the Fed), the new money typically shows up in a demand deposit account (a.k.a., a checking account) of the seller. Commercial banks (which is where most people set up a checking account) are in the business of acquiring money at a price lower than the price they can get by lending money or by purchasing a yield-bearing financial asset --- assets such as U.S. Treasuries, bonds, real estate --- you name it; whatever banking regulations permit. In fact, operating all together as a system, the banking system can purchase up to about 10 times as much as the new money that was injected by the Fed when the Fed bought U.S. Treasuries, kicking the whole money creation cycle off. These days, the Fed pays banks about 75 basis points (three quarters of one percent per year) just to keep the new money on deposit with the bank's regional Federal Reserve Bank. That's not a lot, but the spread between the price the bank pays to use the money, which on ordinary checking accounts is way less than 75 basis points, still provides a little profit for the bank. Of course, banks would like a bigger spread to increase bank earnings, which is why banks will likely use the new money to make new loans or to purchase some other financial asset (like longer-term bonds, housing mortgages, and other securities allowed by banking regulations). Any new money created by the Fed typically gets spent somehow, sooner or later. In fact, the new money gets spent multiple times, not just once. In fact, spending of the new money multiple times as it circulates through financial markets and real-goods markets is what creates credit bubbles, asset-price-inflation, and ultimately, a continuously rising consumer price index. Banks are not usually content to keep the new money in a deposit account with the Fed that pays only 75 basis points. Banks have lots of ways to spend (what banks call "investing") the new money, but all of those ways ultimately bid up the price of something. During the seven-year run up to the Great Recession of 2008, that something was prices of residential housing, prices of commercial property, and prices of one or another financial instrument, such as mortgage backed securities, credit default swaps, and other credit instruments created by the financial engineers of Wall Street. Bottom line, the Fed created a credit bubble, which created an asset-price bubble, as only the Fed can. Borrowers spent the new money the Fed created to purchase other kinds of assets, real and financial, which bid up their prices. A bubble is nothing more than prices of particular assets getting bid higher and higher in a tail-chasing exuberance of people who want to hit it big. That can't and doesn't happen without a central bank (or a collection of colluding banks acting like a central bank). People who pay attention to financial news understand that the Fed has pumped a bit north of $1 trillion dollars of new money into financial markets since 2008, with tens of billions more coming with each passing month at present (QE3). What Fed Governor Stein is at least a tad bit worried about is that all that new money may be pumping a new bubble. Do you think? So where is the bubble this time? A big part of the bubble is in the prices of U.S. Treasuries themselves. The U.S. Treasury just keeps on-a-borrowing. So far, Congress has raised the debt ceiling as needed every few months to keep that borrowing possible. All the pumping by the Fed is the only thing keeping prices of U.S. Treasuries high enough to keep government borrowing costs historically low. In effect, the Fed has purchased about 25% of the Treasury's new debt since 2008. Another part of the bubble is evidently showing up in junk bonds, real estate investment trusts, and bank security portfolios, according to Mr. Stein. By the way, what do you suppose is fueling the rising prices of farm land in the Midwest? Why do you think the price of gold rose from about $800 per ounce in 2008 to more than $1,600 today? The new bubble in town isn't quite as concentrated as the housing bubble was from 2000 to 2007. But that's the thing about bubbles. They sneak up on us. Lots of folks, including the Fed, never really see them as bubbles --- until they explode. Can the Fed let the air out of the new bubble in town just in time to avert an explosion? Ben Bernanke evidently thinks so. The Fed's track record for stabilizing financial markets certainly isn't promising. Why will the new bubble in town be any less destructive of all that fake wealth than the housing bubble was? After all, the bubble has to explode, if for no other reason than to wipe out all those pretenders to wealth, people who have produced no real goods or valuable services to earn their paper wealth. I like to sum it all up this way. You can't really borrow what hasn't already been produced and saved, even if the Fed says you can. But there I go again, repeating my old refrain.